One post… massive shade. Greenline’s Star structure provides a large covered area on single central or corner column. Highly effective as a single unit or as repeated modules across a site. 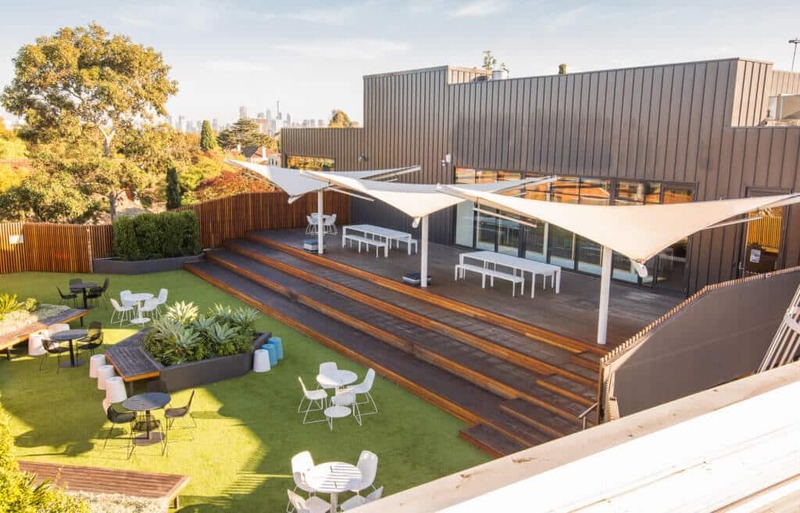 The Star Structure is ideal for all areas at schools, restaurants/cafes, main streets, public parks and pool areas, with hundreds of colour combinations, giving you the ultimate in innovative design, with minimal disruption to the area. Size: 6m to 12m typically. Typical Applications: Learning spaces, urban spaces, pools, parks, eating areas. Key Design Advantages: Maximum shade with minimum posts. Coverage Options: PVC, shade fabric. Put clever engineering to work to create your space. Large clear spans with minimal support steelwork, plus infinite flexibility in design, all help make this one of the most attractive tensile membrane structures you’ll find. The Barrel Vault shade structure is the ideal option where large spans are necessary. This is especially critical over sports courts, swimming pools, aircraft hangars and school quadrangles. Our innovative structure designs are guaranteed to make a statement, and options to customise your structure include posts up to 10m tall to maximise visual impact, lighting and audio to name a few. Size: [W] 6m to 40m typically, up to 100m. [L] 6m to 100m typically, but not limited. Typical Applications: Sports courts, Olympic pools, school quads, aircraft hangars. 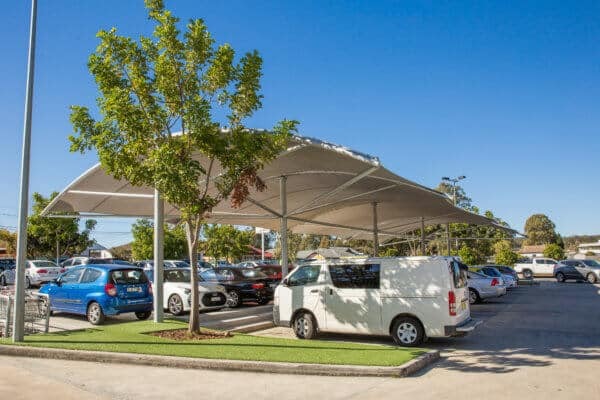 Key Design Advantages: Large clear span, flexibility, letting in natural ambient light whilst blocking 100% UVR, lower edges for maximum weather protection, higher centre for sports clearances, anti-glare. Coverage Options: PVC, shade fabric or metal. The high and low posts keep the sail tight while optimising shading to the area. 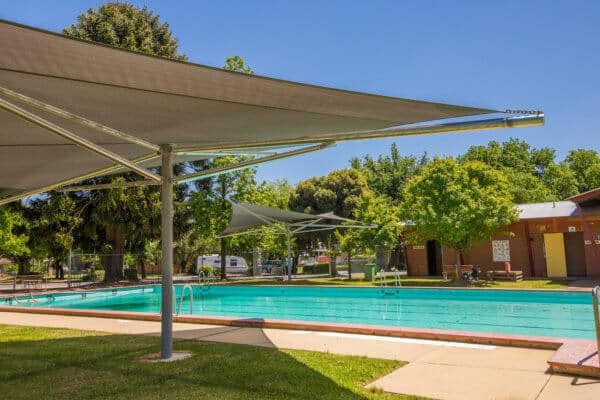 The sail is possibly the most cost effective type of shade structure. 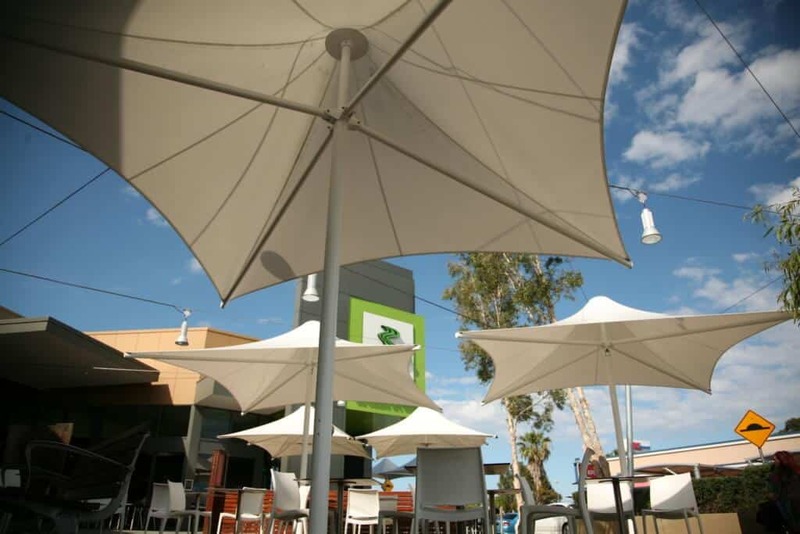 Shade sails add visual appeal, tie in with play elements and define the area. 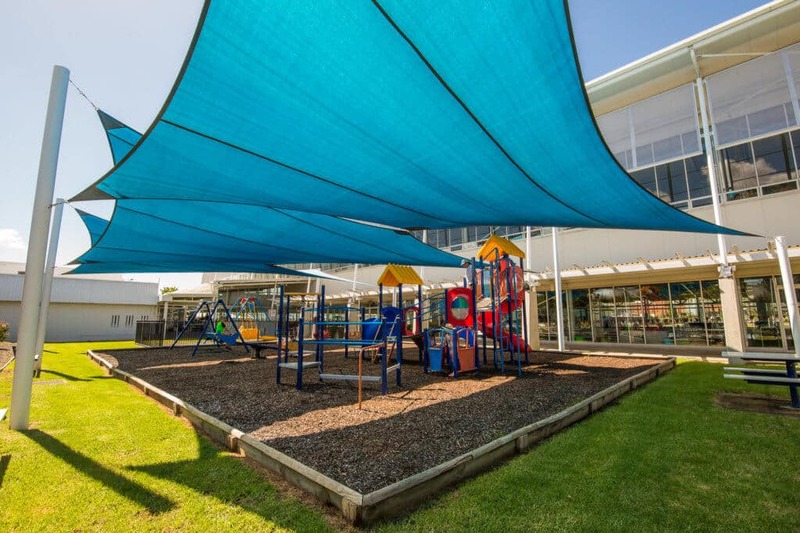 The classic hypar (twisted) shade sail is the most common structure used for play areas, pools and parks. Size: 6m to 20m typically. 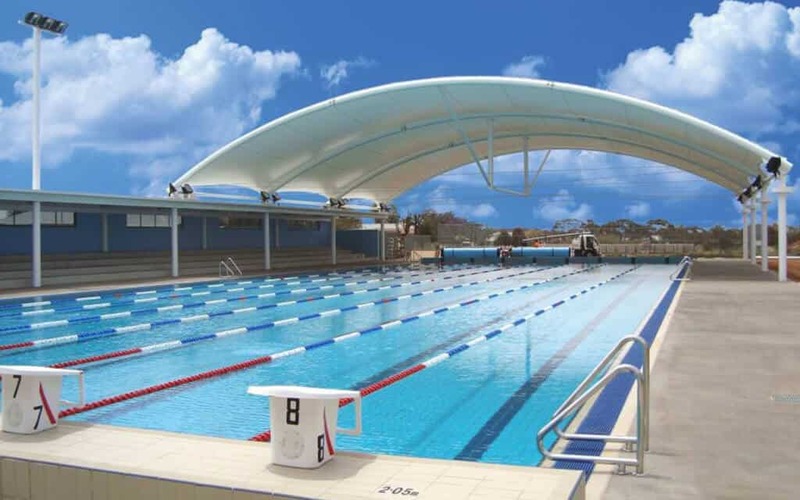 Typical Applications: Playgrounds, pools and pool side areas, car parks and walkways, outdoor eating areas, council parks and gardens. Key Design Advantages: Cost effective, stylish, good UV protection, flexible design, can be suited to your area. A Cantilever structure provides shade right where you want it! The columns are in a line to one side of the area and the supporting rafters span out over the area, pinpointing the shade where it’s needed most. When you need shade but can’t have columns at the extremities, this is the obvious choice. Hundreds of Greenline Cantilever structures have been installed in shopping centre car parks across Australia, because it is the most practical, stylish and long-lasting option. These are most often used in car parks because Australian Standards (AS2890.1) restricts post placement. Size: [W] 4m to 15m typically, up to 25m. [L] 6m to 50m typically, but not limited. Typical Applications: Car parks, pools, awnings against buildings, walkways, courtyards, restaurants. Key Design Advantages: Posts offset to maximise shade + accessibility. 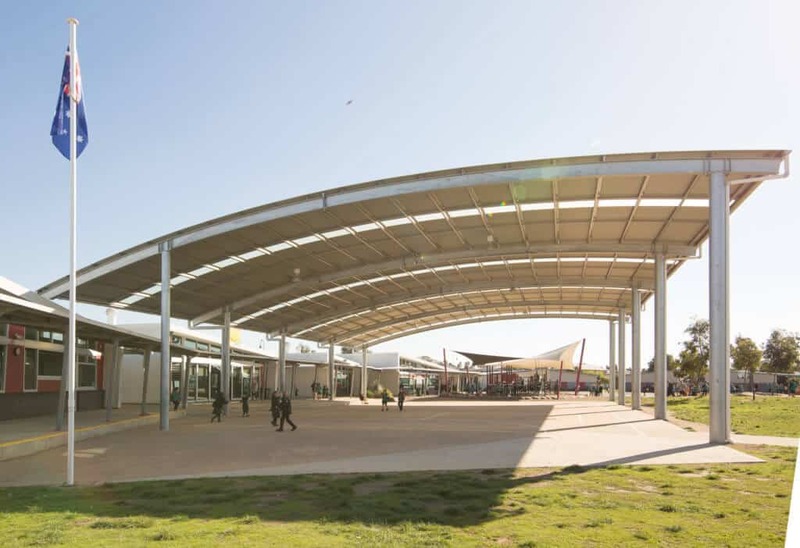 A metal roof or COLA (covered outdoor learning area) structure is a cost-effective, steel shade solution for schools needing waterproof cover to their sports courts, playgrounds and quadrangles. Options of the traditional gable or curved style mean your COLA structure can effortlessly fit in with the existing architecture. Greenline’s attention to detail in the design of COLAs makes them safer (no sharp edges on posts, concealed footing connections, bird proof, long lasting). 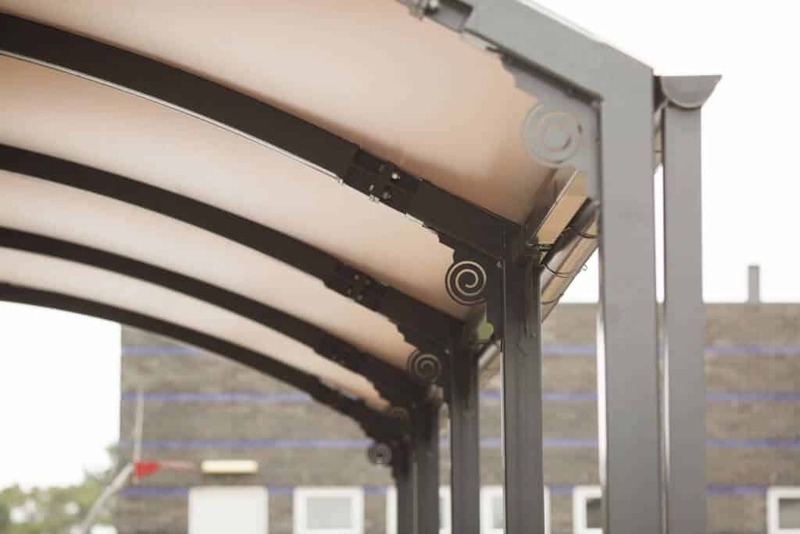 Powdercoated or galvanised steelwork provides both longevity and visual appeal. Clearance heights and overhangs can be infinitely customized to provide the greatest possible usage for your site. Size: [W] 6m to 50m typically, up to 100m. [L] 6m to 150m typically, but not limited. Typical Applications: Schools, shopping centres, recreational areas, car parks, bus shelters, quadrangles, playground equipment, sports courts. Key Design Advantages: Robust, cost effective, excellent vandal resistance. Coverage Options: Metal, options for skylights and acoustic paneling. 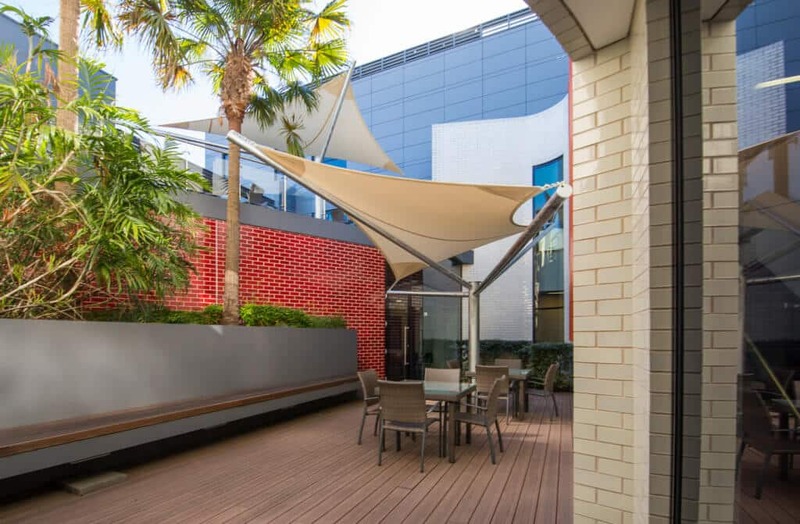 The high centre peak of the Conic shade structure provides a striking aesthetic feature, creating a unique ambience unmatched by any other structure. 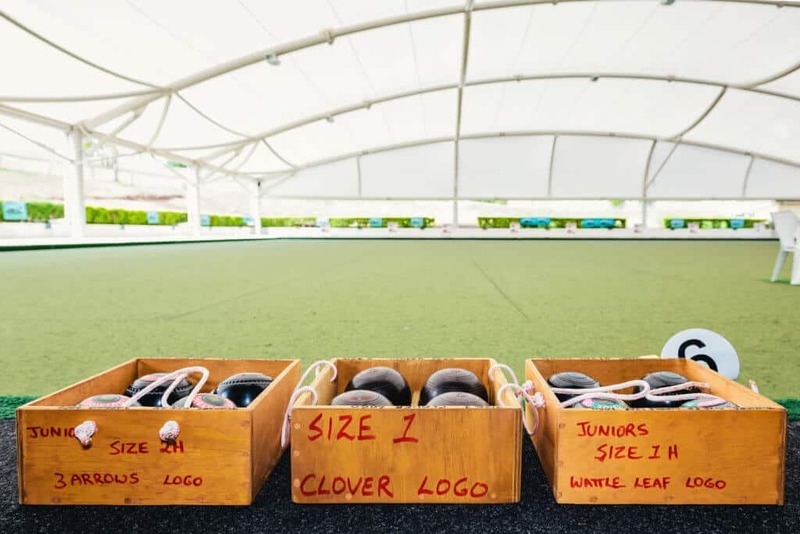 Also known as a pavilion shape, or even just a ‘circus tent’, large areas can be covered with minimal columns, meaning you have better scope to use your space. The low perimeter gives good all day cover, and the high centre point creates a spacious feel without compromising weather protection. Size: 4m to 50m typically, but not limited. Typical Applications: Schools, pool areas, quadrangles, playgrounds. Key Design Advantages: Maximum weather protection with fantastic style.